Acrylic workshop With Samatha Williams- Chapelsky February 8, 2014. Artist Samantha Williams-Chapelsky will lead a workshop in working with acrylic paint. 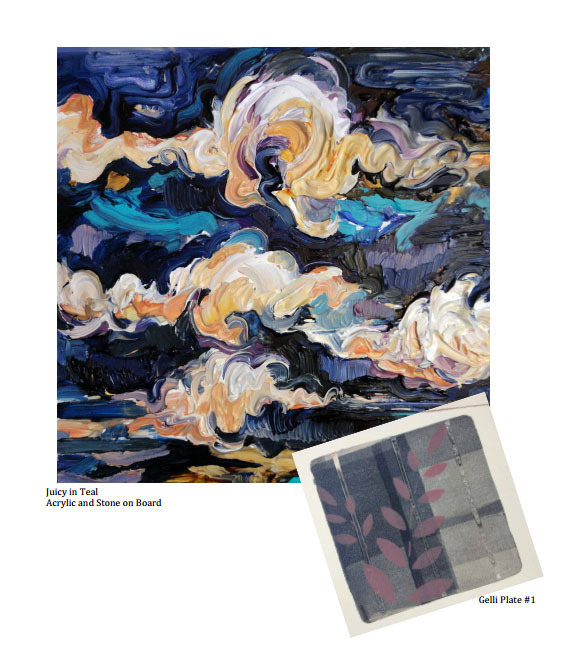 As one of 20 Canadian Golden Artist Educators, Samantha has extensive knowledge of acrylic techniques, products as well as new methods in acrylic practise. She will show case several techniques and give demos of encaustic effects, metallic pigments, fluids, heavy body, high flow and Golden Open Acrylics. Participants will also partake in a hands on workshop on Gelli Plates to create mono prints. Samantha will also discuss her processes and styles of work as well as discuss her inspiration for new pieces. Supplies: bring the following: 2 X (" 9 by 12" canvas panels), a selection of acrylic colors, brushes, palette, water containers, rags, BAG LUNCH. Supplies for the Gelli prints will be brought by Samantha.